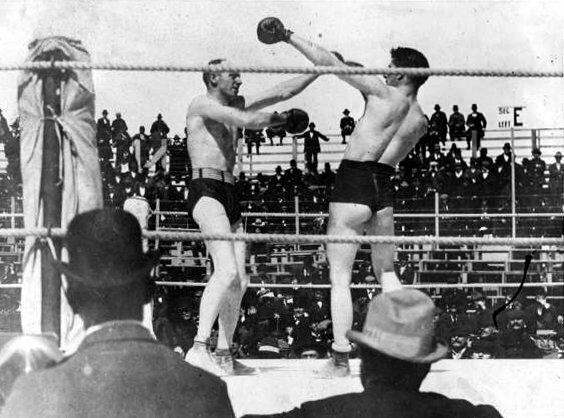 The first Jeffries vs Corbett clash took place in Coney Island over a century ago but the storylines highlighted by that historic battle are ones we have seen on countless occasions since. First, it presented the timeless match-up of the skillful, cerebral boxer in James J. Corbett against the rugged and ferocious brawler in the powerful James J. Jeffries. Second, the match also offered the dramatic story of a younger, stronger champion facing the challenge of an experienced, former great vying for one last chance at glory; in other words, the old king vs the new king. Jeffries (left) and Corbett pose before the match. And it was the old monarch in Corbett who most viewed as the underdog. “Gentleman Jim” was thought to be on his way out due to his age, prolonged periods of inactivity and recent defeats. 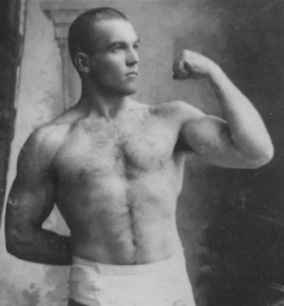 In March of 1897 he had lost the heavyweight championship when he was knocked out by one of the fiercest punchers of all time, Bob Fitzimmons. 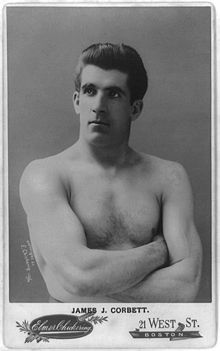 He then suffered a controversial defeat in November of 1898 against the powerful Tom Sharkey in a bout some suspected had been fixed against the former champion. Meanwhile, “The Boilermaker” had rightfully earned a reputation as a savage puncher who mercilessly pounded his opponents into defeat, regardless of pedigree. Having earned the heavyweight title via knockout in a grueling battle against the same Fitzimmons who had defeated Corbett, he feared no one while everyone feared him. 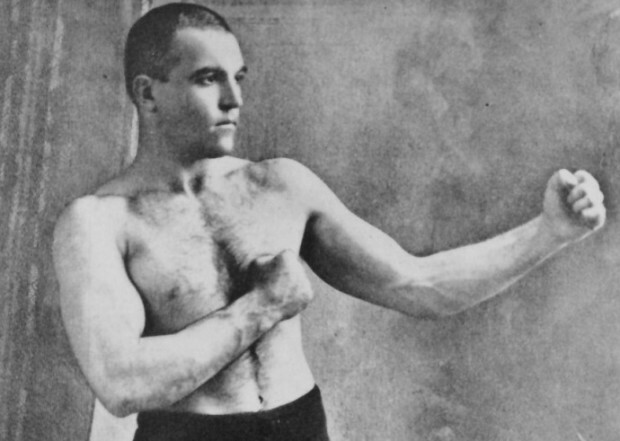 Corbett was regarded as a highly intelligent pugilist who had virtually reinvented boxing technique. He utilized footwork and lateral movement that had never been seen before and he didn’t shy away from clinching to frustrate an opponent’s attack. Most significantly, he constantly revised his own strategy based on what he learned from his opponent’s style during the fight. Jeffries’s plan, meanwhile, was simple enough: plod forward no matter how much punishment he absorbed–his large, heavy frame being well-equipped to handle it–and just keep punching. He knew that sooner or later he would land that one good shot that could turn any fight his way. In the weeks leading up to the match, the public didn’t give the 34-year-old “Gentleman Jim” a snowball’s chance in hell, deeming Jeffries’s advantages in size, weight, power, and age to be more than enough to dispose of Corbett. In retrospect it is easy to accuse the audience of failing to remember that ‘styles make fights’, but at the time it was common knowledge that Corbett was not only going to lose, but lose badly. When the two champions finally stepped into the ring, Jeffries outweighed Corbett by at least 30 pounds, and most observers were curious about the outcome more out of a sense of morbidity than from interest in a good sporting contest. But the challenger astonished everyone by turning the tables on his younger, bigger adversary. In front of an awestruck audience of over eight thousand, the veteran Corbett put on a boxing clinic worthy of remembrance. For 22 of the scheduled 25 rounds, he boxed circles around the younger champ. He danced, weaved, ducked and moved and made Jeffries look like a fish out of water. “The Boilermaker” chased after Corbett the way a poker player on his last stand chases after the river card, but he didn’t seem to even belong in the same ring as Corbett. No matter how hard he tried, Jeffries’s bombs kept hitting air, while he received constant punishment from Corbett’s precise and perfectly timed blows. By round 20, the Boilermaker’s corner had worked itself into a panic, warning the champ he needed a knockout to win. Jim was well ahead on the scorecards, and showed no sign of losing steam as the fight neared its end. But what could the champion do except keep pursuing “Gentleman Jim,” doggedly stalking Corbett in the hope of landing the one big shot that could turn things around? And land it he did. In round 23, he caught Corbett with a short, stiff right hand just as the challenger, having avoided a left hook, bounced off the ropes. The blow landed flush and put Corbett’s lights out, the former champion sunk into unconsciousness before he even hit the canvas. Jeffries had caught his river card, big time, at the same time giving boxing one of its truly legendary one-punch knockouts. Thus Corbett’s gallant challenge was repelled, as were all challengers who vied for Jeffries’ title belt. Incredibly, Jeffries never lost his championship in the ring and would suffer only a single defeat in his boxing career, that in a comeback bout against the “Galveston Giant,” Jack Johnson, in another historic fight many years later. 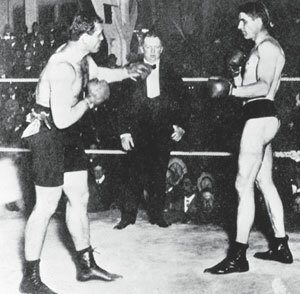 For his part, Corbett competed only twice more before finally retiring for good, one of those contests a rematch against Jeffries in 1903, which he also lost by knockout. But that night in Coney Island three years before saw Corbett give what many came to regard as, despite the outcome, perhaps the finest and noblest performance of “Gentleman Jim’s” entire career.